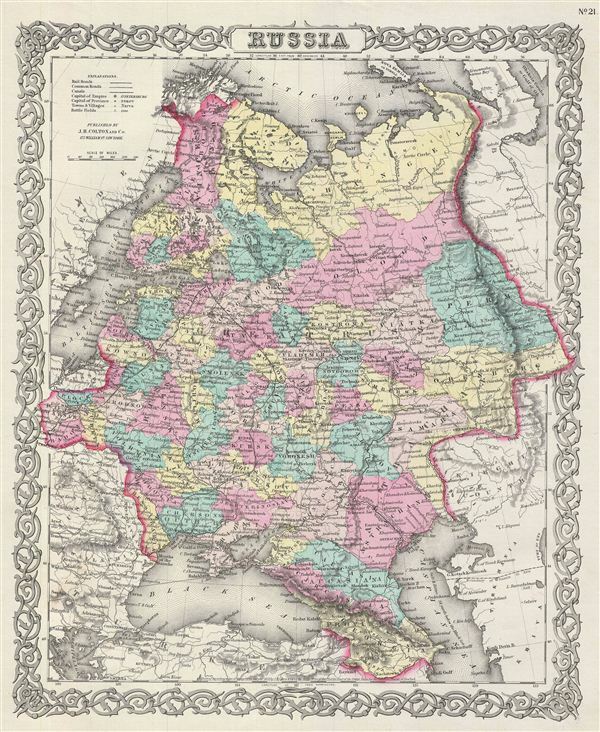 An excellent 1855 first edition example of Colton's map of Russia. Like most of Colton's Russia maps, this map was derived from an earlier wall map of the world produced by Colton and D. Griffing Johnson. Depicts the european portions of Russia from the Arctic Sea south to the Black Sea and Caspian Sea. extends west as far as Warsaw and east as far as Orenburg and Perm. Includes the Ukraine. Russia at this time was under the suzerainty of Tzar Alexander the II. Alexander is best known for his liberal reforms including the emancipation Reform of 1861 which liberated Russia's countless serfs and is considered to be the most important event in 19th century Russian history. This map also identifies various cities, towns, villages, rivers, rapids, railroads, mountain passes, and an assortment of additional topographical details. Several battlefields are noted, including the 1700 Battle of Narva, one of the early battles of the Great Northern War. Map is hand colored in pink, green, yellow and blue pastels to define national and regional boundaries. Surrounded by Colton's typical spiral motif border. Dated and copyrighted to J. H. Colton, 1855. Published from Colton's 172 William Street Office in New York City. Issued as page no. 21 in volume 2 of Colton's 1856 Atlas of the World. Rumsey 0149.088 (1856 edition). Phillips (Atlases) 816.